Diagnostic Features - Mandibles subtriangular, dentate and with a single tooth on the basal internal margin. Median portion of clypeus projecting over the basal borders of the mandibles when fully closed. Antennae 12-segmented with a 2-segmented club, the apical segment being much larger. Propodeum with a pair of spines. Bolton (1973a) reported that specimens (unnamed) had been recovered from Berlese funnel samples of leaf litter from the West African forest zone, but thought it probable that the genus had been spread by human activity from the Papuan region. He has never enlarged on that statement, however, and the genus does not appear in the (Bolton's) key to African genera in Hölldobler & Wilson (1990), nor in Bolton (1994). Bolton (1995) has six species - three with type location in Central America and one each from New Guinea (Adelomyrmex biroi), Fiji and Samoa. Emery, C. 1897c. 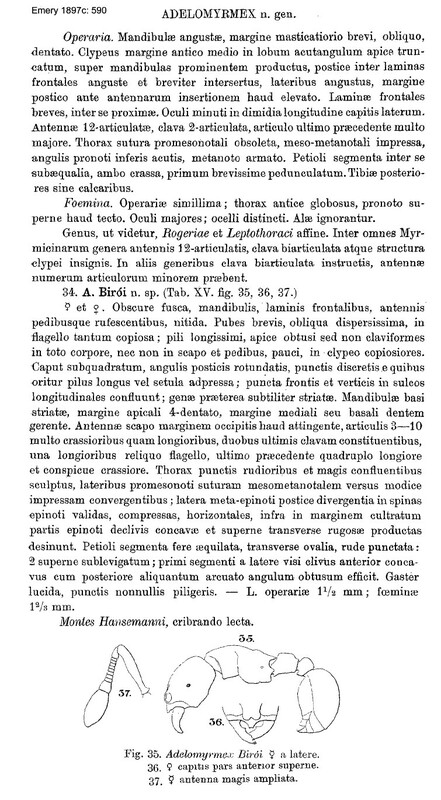 Formicidarum species novae vel minus cognitae in collectione Musaei Nationalis Hungarici, quas in Nova Guinea, colonia germanica, collegit L. Biro. Term. Fuz. 20,:571-599 - . As at November 2017, Antweb.org does not include Adelomyrmex amongst the ant fauna of the afrotropical region.